Here I am, back in the sky again, onboard Silk Airlines flying to Singapore and then on to Male, the capital of the Maldives, later tonight. Where have the last two months disappeared? You may have noticed a lack of input on the blog since the last trip and I’m struggling to find a good excuse! Once I was back home in December 2009 I was immediately engulfed in the Christmas holidays and then Scubazoo’s start to the new year was as busy as ever. The one thing about living in Sabah is the fact we celebrate every single religious holiday and Chinese New Year has just passed which is like Christmas on steroids – fireworks, parties, eating and drinking galore! So…. hoping that I can still fit into my wetsuit, it’s time to get cracking on our latest photo expedition. I will be meeting Adam at Male airport tonight and then tomorrow we head down to Alila Villas Hadahaa Resort on Gaafu Atoll for two weeks. After that it’s back to Male before we set sail on Sultan of Blue for a two week safari around Meemu and Vaavu Atolls. Scubazoo Cameraman Roger Munns will be joining us for that leg of the trip, filming for the DVD that will accompany the book, as well as getting some behind the scenes video of the making of the book. There will be more on those locations over the next month as we have interesting encounters to report so please subsribe to the RSS feed. Right now it’s time to play catch up – let’s go back to the end of our last trip in December 2009. Our final location was the stunning Angsana Ihuru resort. Upon arrival we immediately explored the house reef, a mere 40m walk from the dive centre. Most of the diving around the Maldives is done either by live-aboard or dive dhoni from a resort which can be time consuming. As a photographer I love to revisit sites to shoot creatures in a different way, wait for behaviour to happen or simply to get the best light at a certain time of day so I really appreciate a good house reef which I can dip in and out of at will. 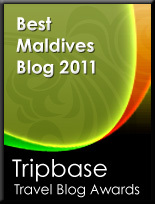 I have to say Banyan tree has the best house reef I have encountered at any resort in the Maldives. It has everything from tiny macro critters to schooling barracuda and a very lively wreck at 18m. I could have dived it for weeks. We were given location details for a red frogfish before our first dive and it only took 5 minutes to find him strutting his stuff on top of some metal framing, next to the wreck, waiting patiently for the small glassy sweepers to be attracted to his lure. Both myself and Adam managed to get great shots of him yawning – his polite way of telling us to move on and stop flashing him with our underwater strobes! As we explored the house reef, more and more critters revealed themselves and to our surprise we even managed to discover a few jawfish down at about 20m, poking their heads from their holes in the rubble. Even more exciting was the fact one of the males had a mouth full of eggs. The eyes could already be seen in the eggs, meaning they were likely to hatch over the next few days – the challenge was on. When the jawfish eggs are ready to hatch the male assists them by spitting them into the water column usually when the current is flowing and (unfortunately for me) usually at the crack of dawn! The next few days therefore consisted of 5am alarm calls and lots of waiting for the jawfish to comply with my photographic wishes. On the third day I thought it must be time for the hatching and I was correct….. only I must have been 5 minutes late as the eggs had disappeared, all those dawn missions had been for nothing. During our stay we took some time to document some of the great conservation work they do at Angsana Ihuru and Banyan Tree Vabbinfaru. The program has been going on for over 10 years. From coral replanting to turtle conservation they have really grasped the responsibility they have as a resort, to not only protect but to try and restore the underwater life to what it once was. They also have a stingray feeding session every afternoon which is a great way to educate the guests about these amazing creatures and an opportunity we couldn’t pass up to get some really close-up images. We were told that the pink whiptail rays which come in to be fed are extremely friendly but I was about to find out just how friendly…. Mohammed Ali, the guide, invited me into the water and as soon as I got down low to capture the half & half shots I was after, the rays were all over me! With over 60kg of ravenous ray trying to mount me with its enthusiasm to be fed, not only did I struggle to get the shot but I also gulped down a huge amount of seawater in between all the laughter. A truly unique experience! Thanks to all the staff at Banyan Tree and Angsana for their kindness and hospitality. More soon from the Southern Maldives. Great Stuff Jase. See you both out there real soon. Those were great pictures, I had a good laugh! Thanx, keep it up boys! Man that stingray was giving you some real love! Will that be in the book? Hope you are having fun Jase. Everyone misses you terribly. Thanks for the comments, there will be various shots of the rays in the book but I’m not sure if the images of me being molested will be in there – maybe in the ‘making of’. All images are copyrighted by SCUBAZOO. Do not use without written permission. For any enquiries, you may find our contact information here.